In a large non-stick skillet heat 1 tablespoon olive oil over medium high heat. Add onion, kale and zucchini. Cook for 5 minutes until crisp-tender. Add garlic, lemon and zest, vinegar, capers and olives. Cook another 3 minutes, then remove to a bowl. Add another tablespoon oil to the skillet and add chicken, oregano and thyme. Cook for 5 minutes until chicken is cooked through. Add back the vegetables and heat through. Toss with tomatoes and feta. Serve with tortillas. 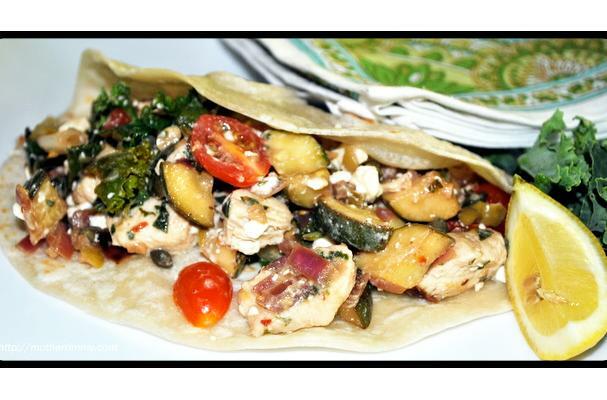 This healthy chicken wrap recipe has a Mediterranean flair thanks to the addition of lemon, capers, balsamic and feta cheese.